Since 2006, EDC’s Center for Children & Technology and SRI International have conducted research and evaluation studies to measure children’s learning outcomes under the Ready To Learn initiative. This initiative, supported by the U.S. Department of Education, has allowed the Corporation for Public Broadcasting and PBS to develop media-rich literacy and math learning resources for young children, with the goal of improving school readiness among preschoolers in high-need communities. 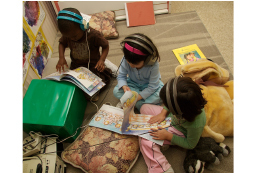 Our context studies have examined how technology and transmedia are incorporated into children’s homes and classrooms, and our large-scale randomized controlled trials have measured the efficacy of public media in supporting children’s learning. In an illuminating new report, Reflections on the Ready to Learn Initiative, 2010 to 2015, EDC and SRI share progress and potential leverage points in using educational media and community engagement to enhance the school readiness and success of children living in low-income households. As the summative evaluation partners to the Corporation for Public Broadcasting (CPB) and PBS, EDC and SRI have measured children’s learning outcomes under Ready To Learn (RTL) for a decade. This report draws upon interviews with 26 prominent children’s media researchers, producers, and thought leaders and a review of scholarly articles and reports to provide a big-picture view of the status and future directions of children’s media. The two-page handout "New Directions for Educational Media" summarizes the eight ways in which educational media producers can foster young children's school readiness and success, as identified in the full report, Reflections on the Ready to Learn Initiative, 2010 to 2016. Our newest study was a randomized control trial that examined the use of PBS KIDS PEG+CAT transmedia in the homes of children with low-income parents. Our research addressed the question of how time spent viewing and playing with educational, noncommercial media can benefit young children’s math learning, especially for those growing up in under-resourced communities. The program was implemented over a 12-week period, and found that children who used the PEG+CAT media showed strong improvement in important math areas such as ordinal numbers, spatial relationships, and 3-D shapes. Also, families in the treatment condition reported that they felt more confident in their ability to teach their children math. An Executive Summary and two-page Highlights from the report are also available. One recent study involved a unique transmedia property, PEG+CAT, that emphasizes early mathematics and problem solving. The study examined how 59 four-year-old children engaged with and learned from selected sets of PEG+CAT videos and interactive games over five less-than-hour-long interactions. These five independent, unmediated interactions took place in a controlled learning laboratory setting. Children improved on some math skills over the course of the study. You can also download the four-page Executive Summary and two-page Highlights. This study examined whether a PBS KIDS transmedia mathematics curriculum implemented by teachers in early learning centers could positively affect children’s math skills. The study found that to be the case—children learned significantly more math, and teachers expressed both greater comfort with technology and more confidence in their math teaching. More information about the study is contained in a press release, available here, and in an article, "Ready and Learning," on the EDC website. You also can download the five-page Executive Summary and two-page Highlights.